The Department of Defense and military agencies use the foreign policy exemption in Executive Order 13526 to deny or heavily excise documents that are well over 50 years old. According to Pentagon claims, declassifying information from that far back could cause significant harm to U.S. diplomacy. That many of the same documents have been declassified since the 1990s raises questions about the discernment of those agencies and whether they should be in a position to unilaterally substitute their judgment on U.S. diplomatic necessities for the State Department’s. Under Executive Order 13526 signed by President Barack Obama in December 2009, and still in effect, classified documents 50 years or older, must be declassified unless they include the names of confidential intelligence sources or information on weapons of mass destruction technology. The executive order includes an escape clause for the 50-year rule; under section 3.3 (h) (2), “in extraordinary cases” agencies can request permission to exempt “additional specific information.” In practice, this means, for example, that agencies can use the standard Executive Order exemptions deny information. For example, Defense can apply Section 3.3 (b) (6) of the executive order to restrict old documents whose content would supposedly “reveal information, including foreign government information, that would cause serious harm to relations between the United States and a foreign government, or to ongoing diplomatic activities of the United States.” As it turns out, this gives the Pentagon authority that it has misused. In recent decisions on mandatory review cases, Defense Department reviewers used the E.O. foreign policy exemption to deny or heavily excise documents that have been in the declassified public record for a number of years. Examples are discussed below. The purpose of the discussion is not to rebuke Pentagon declassification reviewers for being unaware that documents have been declassified. There are many declassified documents at U.S. government archives and presidential libraries. The point is to raise questions about the judgement of the reviewers. How can they seriously believe that these 50-year old documents remain so sensitive that disclosing them would cause serious harm to U.S. foreign relations? A recent example of the evident misuse of the foreign policy exemption concerns documents from the Cuban Missile Crisis, October 1962, held among State Department records at the National Archives (College Park). In response to a mandatory declassification review request by journalist Michael Dobbs, the National Archives organized security review by agencies that were deemed to hold information “equities” in the documents. In the first response to the request, NARA informed Dobbs that the Department of Defense had withheld in their entirely 18 documents (over 190 pages) from declassification on the basis of E.O. exemption (6) as well as the Atomic Energy Act [6.2 (a)]. It is not clear whether the Defense Department had exempted all, or just some, of the 18 documents on the basis of both two exemptions. As indicated below, some of them have nothing to do with nuclear weapons. Even though the collection is in State Department records, that agency withheld no information from Dobbs’ request. Notwithstanding the fact that these documents were produced nearly 55 years ago during a crisis whose basic contours and substance have been declassified for years, everything from invasion plans and intelligence collection to secret negotiations and alliance diplomacy, it is perplexing that the Pentagon finds it necessary to use E.O. exemption (6) to withhold information on those events. Apparently, declassifying information about the crisis could damage U.S. foreign relations! Yet, as it turns out, more than a few of the exempted documents have been declassified in their entirety since the 1990s, when the State Department was declassifying documents in response to requests from the National Security Archive and when, in 1998, the State Department published documents on the crisis in its historical series, Foreign Relations of the United States. Specific identification is possible because the withdrawal sheets in the collection provide dates and titles of the documents that remain in the vault at NARA. As for the Atomic Energy Act claims mentioned above, a few of the documents exempted in this case, but previously published by the State Department, might be said to include information characterized as “formerly restricted data.” As they have been in the State Department’s open record for nearly 20 years, however, their special status weakens any claims about FRD. One of the documents exempted by the Defense Department is an intelligence community product, published on 19 October 1962, “Joint Evaluation of Soviet Missile Threat in Cuba.” This document was published in 1998, in the FRUS microfiche supplement. In 1992 the CIA published the same information in its collection, CIA Documents on the Cuban Missile Crisis, edited by Mary S. McAuliffe. Whether the Defense Department believes that this item is classified atomic energy information or harmful to U.S. foreign relations is unclear. Another document withheld by Defense, “Air Strike Scenario,” is also published in the 1998 FRUS microfiche supplement. This document reviews the political and diplomatic approach that would be taken if the United States attempted to destroy the Soviet missile deployments with a surprise attack. What may have contributed to Defense Department hackles is a sentence on page 3 referring to nuclear weapons in Italy and Turkey. As sensitive as this information was at the time, U.S. nuclear deployments in Italy and Turkey have become one of those open secrets that the classification system cannot conceal. 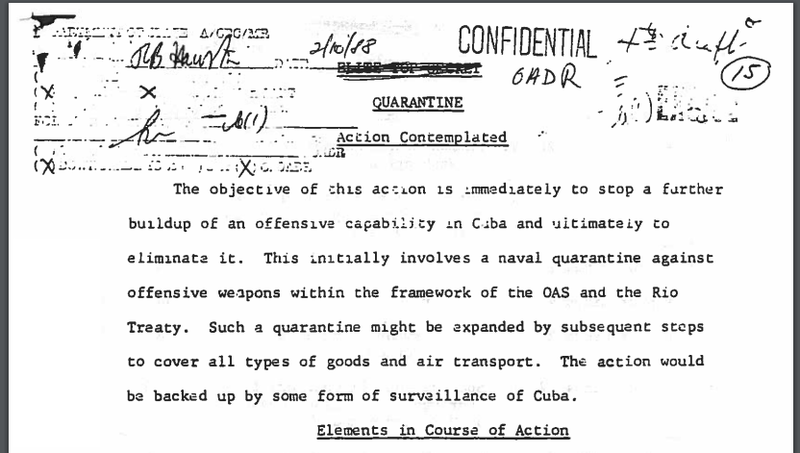 Also exempted by the Pentagon was a State Department memorandum from about 20 October, 1962, “Quarantine” a timetable for military and diplomatic action that would be taken up to the moment when the United States imposed a blockade of Cuba. The State Department declassified this document in response to a request from the National Security Archive during the late 1980s. Also exempted by the Pentagon are the Joint Chiefs of Staff’s instructions, sent 22 October 1962, to the Commander in Chief Atlantic Command (CINCLANT) Admiral Robert Dennison ordering him to make preparations for the blockade. This document is available in the FRUS microfiche supplement. The Pentagon’s reasons for classifying this telegram are inscrutable. A State Department document titled “Cuba,” dated 23 October 1962, and released in its entirety by the Department to the National Security Archive during the 1990s, was also exempted. The Pentagon may regard it as sensitive because of the discussion of withdrawing Jupiter ballistic missiles from Turkey as part of a diplomatic settlement. 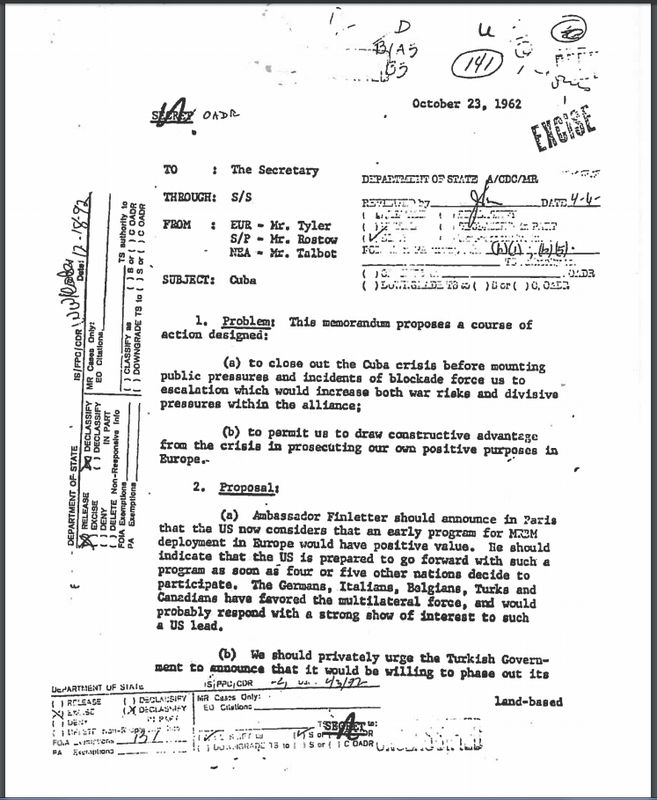 Even though the Defense Department’s official history of Robert McNamara as Secretary of Defense includes detailed discussion of the role of Jupiter deployments in both Turkey and Italy during the crisis, the Department’s reviewers go to absurd lengths to avoid declassifying information about the Jupiters. A sentence concerning U.S. nuclear weapons in West Germany is another non-secret because the fact of the deployments was declassified during the 1990s. The Department of the Navy and the Defense Department jointly provide another recent example of silly foreign policy secrecy. In response to a request made in 2011, the Navy recently released a heavily excised version of a memorandum signed by Chief of Naval Operations Arleigh Burke concerning a White House meeting on nuclear policy issues, held on 22 September 1959. President Dwight E. Eisenhower attended the meeting, as did Atomic Energy Commission chairman John McCone and Under Secretary of State C. Douglas Dillon. According to the Navy’s letter, the Navy Department and the Defense Department withheld large chunks of the document by citing the 3.3 (b) (6) foreign relations exemption. In addition, one piece of information in the memorandum on page 3 was excised under exemption 3.3. (b) (2), designed to protect “information that would assist in the development, production, or use of weapons of mass destruction.” Tellingly, the Department of Energy (the successor to the AEC) had no objection to declassifying this document in its entirety. White House staff secretary Andrew J. Goodpaster attended the meeting and prepared a detailed account of it, which has been declassified in its entirety in a FRUS microfiche supplement published in 1998, although not on-line. The Goodpaster version shows that the withheld portions on pages 1 through 3 concern the staging of special experiments (generally known as “hydronuclear tests”) to check the safety of the fission primaries incorporated in thermonuclear weapons. “CREEP testing” referred to the use of high explosives and increasingly larger, but minute, quantities of plutonium (they would creep up in size) tested in a weapons configuration to determine the safety of a particular device. Such tests have been called “zero nuclear yield”, but the actual yield exceeded zero, although only fractions of a pound. (See Eric Schlosser, Command and Control: Nuclear Weapons, The Damascus Accident, and the Illusion of Safety, at 197-199) These safety tests were a subject of continuing discussion in the Eisenhower and Kennedy administrations and more information on them has been declassified in the FRUS. As sensitive as this topic may have been in 1959, policy discussion on hydronuclear experiments has been declassified for years. The Defense and Navy Department’s belief that declassifying much of the discussion of the safety experiments could harm U.S. foreign relations suggests that they were grasping for a reason to restrict the information. That the Energy Department had no objection to release indicates that the Navy-Defense decision that declassification of a passage on page 3 would disclose information about weapons of mass destruction is highly suspect. 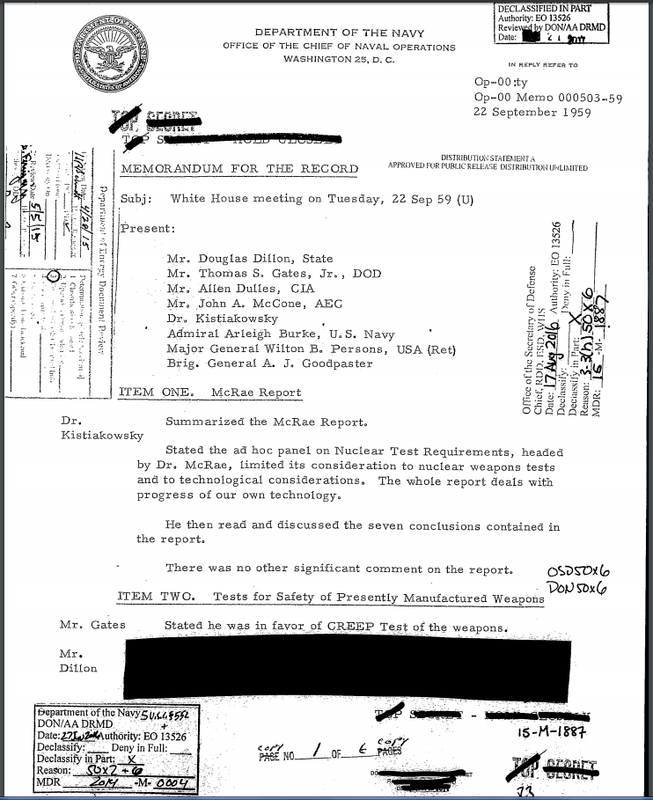 The declassified Goodpaster version indicates that the information excised on pages 4 through 6 of the Arleigh Burke version concerned the Netherlands government request for an atomic cooperation agreement concerning access to U.S. nuclear submarine technology. This involved complex alliance issues because other NATO governments, France, Italy, and West Germany, were also interested in developing nuclear-powered submarines. One concern expressed at the meeting was the security of technical nuclear information; e.g. whether it would be safe in France where, according to Douglas Dillon, the “atomic activity is penetrated by Communists.” On the Netherlands, Eisenhower argued that “if we have allies we must treat them like allies.” Dutch security was good, according to CIA director Allen Dulles. McCone, however, wanted the U.S. to build the submarine for the Netherlands, although he acknowledged that they would rather do it themselves to save money. Again, declassifying Arleigh Burke’s version of this discussion could in no way harm U.S. foreign relations more than fifty years after the fact. The routine misuse of the foreign relations exemption by the military agencies demonstrates the need for tightening up of the 50-year rule in the Executive Order. An updated Executive Order should include checks on the discretion of the military agencies to use the foreign policy exemption to excise or withhold documents. (That should also be true of FRD under the Atomic Energy Act because it is evident that Defense officials do not know what is already declassified). As the Defense Department has also applied exemption (6) to more recent information, e.g. from the 1970s, further constraints should be considered. But with the Pentagon pulling the weight that it does today, and State Department leadership in retreat, it is doubtful that any reasonable reforms will occur in the foreseeable future. My criticisms notwithstanding, I appreciate the work that the defense agencies put into handling mandatory review requests. All the same, if they want their declassification processes to have reasonable credibility, they need to develop far better criteria for reviewing historical documents.